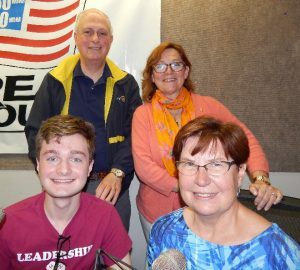 Marjorie Nichols Keith, Executive Director of the Putnam Country Cornell Cooperative Extension, brings 4-H Club member Patrick Salerno to RadioRotary to help tell about the 47th annual Putnam County 4-H Fair at Veteran Memorial Park in Carmel. The Fair is a big family event with food booths, music, a Master Gardener plant sale, horse and dog shows, an auction, and activities such as Touch a Truck and a magic tent. There is free admission and free parking. Over 500 volunteers make the weekend event happen, ranging from Rotary clubs, Lions clubs, village officials, and of course 4-H clubs. If you are not in Putnam Country, you can check your county’s Cornell Cooperative Extension Website for the location and dates of the fair nearest you.